Earlier we reviewed the book Zero to One by Peter Thiel who argues that if you want to start a business, make it a monopoly. “Competition is for losers,” he claims. This conclusion is based on a study of 150 strategic moves (spanning more than 100 years across 30 industries). The authors say lasting success comes not from battling competitors but from creating “blue oceans” – untapped new market spaces ripe for growth. A great example of this is Cirque du Soleil, the Canadian (and now international) mixture of art and circus. Cirque’s model was to create a circus so different from anything already existing that it would have no competition. That’s exactly what happened. Another example is Southwest Airlines in the US which decided to offer an alternative to those travelling by car between cities in the US. It did this by introducing frequent flights, quick check-ins and low prices. The strategy was a runaway success – again, it created what the authors say is a “blue ocean” where Southwest was the lone whale swimming among minnows. The book urges companies to search for ways to gain uncontested market space rather than engaging in traditional competition. To support their theory, the authors invite readers to consider the business climate of 20 years ago, and the numerous new business opportunities that have arisen since then. 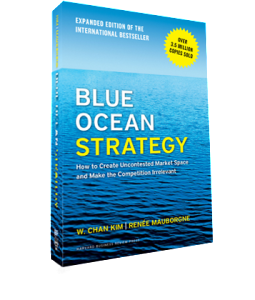 The authors say that blue ocean strategy is successful because it simultaneously attracts large numbers of customers while raising the cost of competition. “When imitation requires companies to make changes to their whole system of activities, organizational politics may impede a would-be competitor’s ability to switch to the divergent business model of a blue ocean strategy,” Kim and Mauborgne wrote. The book offers businesses and entrepreneurs the framework and the tools for creating and capturing “blue oceans,” including a strategy canvas, value curve, four actions framework, six paths, buyer experience cycle, buyer utility map and blue ocean idea index.These visual frameworks and tools are designed to not only effectively grow the collective wisdom of a company, but also facilitate effective strategy execution through fluid communication. Raise: What factors should be raised well above the industry’s standard? Kim and Mauborgne said that this exercise forces companies to scrutinize every factor of competition, helping leaders discover the range of assumptions they unconsciously make while competing. This exercise also pushes leaders to simultaneously pursue differentiation and low cost in order to break the value-cost trade-off. The questions also spotlight companies that are focused only on raising and creating, in the process lifting the cost structure and often over-engineering products and services. I’ll come back once again. Very great post. I simply stumbled upon your blog and wished to say that I have truly enjoyed browsing your blog posts. In any case I will be subscribing to your rss feed and I am hoping you write once more soon! I am often to blogging and i actually respect your content. The article has actually peaks my interest. I’m going to bookmark your web site and maintain checking for brand new information. to bookmark your site and keep checking for new tips. So good to discover another person with some unique thoughts on this subject. Hi there, always i used to check weblog posts here early in the daylight, as i enjoy to learn more and more.